The level should be read with the engine switched off and on level ground. This should be checked frequently, and immediately if you notice even the slightest loss in braking efficiency. The engine may be hot when carrying out operations in close proximity. 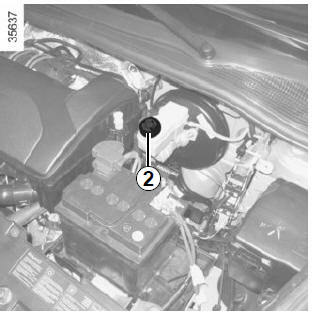 In addition, the engine cooling fan can come on at any moment. It is normal for the level to drop as the brake shoes become worn, but it must never drop lower than the “MINI" warning line. If you wish to check the disc and drum wear yourself, you should obtain the document explaining the checking procedure from the manufacturer’s network or web site. After any operation on the hydraulic circuit, a specialist must replace the brake fluid. Only use fluids approved by our Technical Department (and taken from a sealed container). Refer to the Maintenance Document for your vehicle. Consult your approved dealer at once if you notice an abnormal or repeated drop in any of the fluid levels.